Healthy Peanut Butter and Jelly on Toast. OH. MY. FOOD! 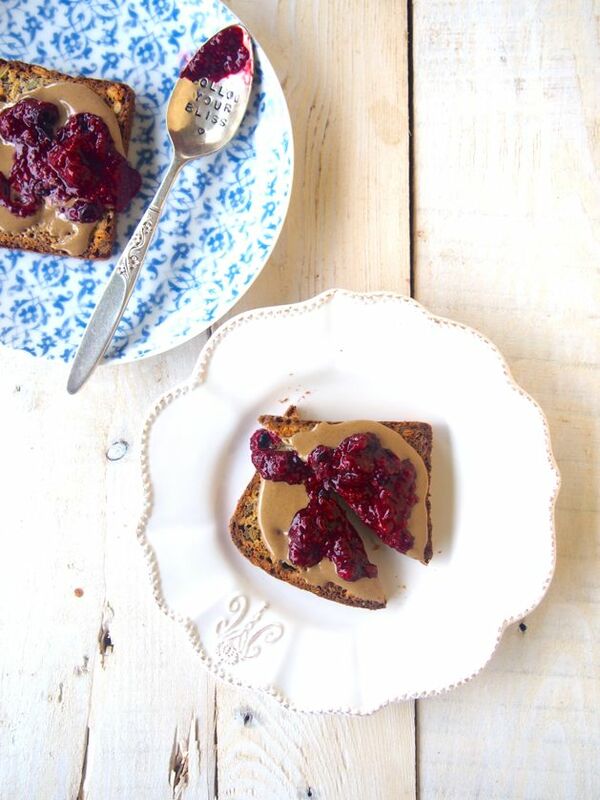 Healthy Peanut Butter and Jelly on Toast goodness get in our bellies! This recipe was part of our Make Life Merry Challenge! And now we’ve turned these challenges into our Merrymaker Club! Intrigued? Yes! Check it out HERE. We actually used unhulled tahini for the ‘peanut butter’ in this recipe which is totally delicious. Stick to to peanut butter if you eat it or swap to any nut butter… macadamia, brazil, cashew, almond. You get the picture, this recipe works with ANY nut butter! Anyway! Back to the recipe! This Healthy Peanut Butter and Jelly on Toast is #amazing. You can buy gluten free or paleo bread, but if we were you we’d make a loaf this Pumpkin Paleo Bread recipe and simply swap the spices for cinnamon! You could also use paleo banana bread instead… that would be epic-ly yum. We toasted our bread before hand because we wanted to but you definitely don’t need to do that! Plus, you can mix up your bread toppings! Think chocolate, coconut, berries, cacao nibs, bee pollen and more! The options for toppings really are endless! 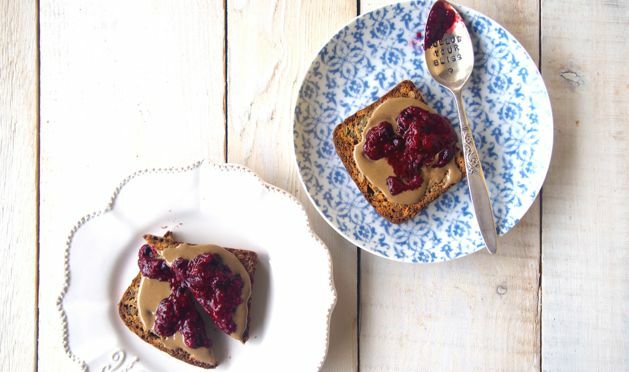 If you make some of your own Healthy Peanut Butter and Jelly on Toast… we’d LOVE to see them! Post a photo on Instagram and tag #themerrymakersisters or #makelifemerry! Place the berries and water into a sauce pan on medium heat and mash until smooth with a fork. Add the chia seeds and stir for about 5 minutes. Place the jam into a jar or bowl and into the fridge. Allow to completely cool in fridge. 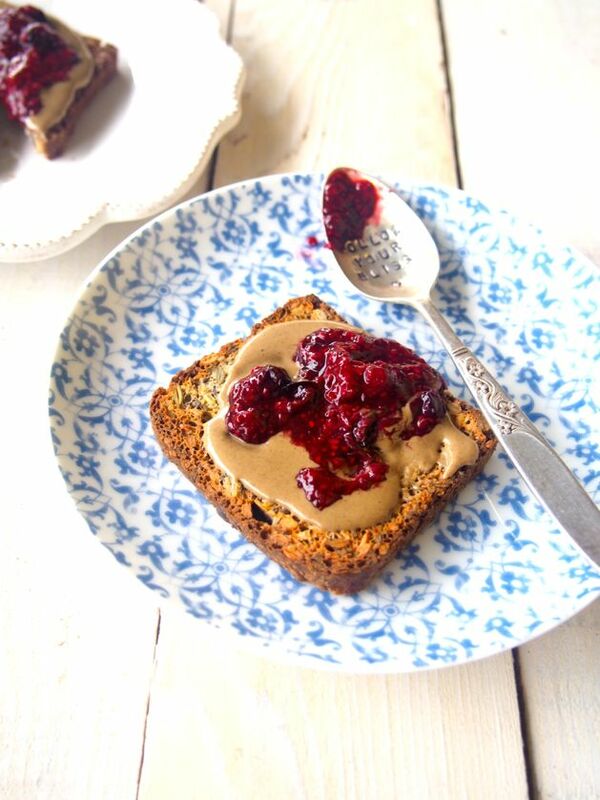 Once ready to eat, toast your slices of bread, top each slice with peanut butter and berry jam! Use different toppings like paleo choccy, toasted coconut, bee pollen, banana. EVERYTHING! Make the chia jam the day before so it's ready to go when you're ready to eat! Reminder: paleo banana bread recipe is here and the paleo pumpkin bread recipe is here.